All the while, Amazon Web Services (AWS) - the leading public cloud provider - has been advocating for the demise of On-Premise Private Cloud. Its nearest alternative offering is Virtual Private Cloud (VPC) where you could really build one anytime, anywhere. Using its free usage tier, I've built a base VPC with two EC2 instances (or VMs) as depicted below. What's EC2 Instance? It's Virtual Machine. What's VPC? Virtual network on cloud where you can create multiple IP subnets on it. EC2 instances may be hosted on a VPC. What's Security Group? Think of it like a L2 firewall where you can configure the network access rules e.g. only allow HTTPS to the public Web instance from Internet etc. It is associated to one or more instances. What's Subnet? The usual IP subnet that we knows of. A VPC is made up of one or more subnets. You can configure which subnet is public facing and which are not. In my example, 10.10.1.0/24 is public facing and 10.10.4.0/24 to host my internal instances. What's Network ACL? Think of it like the usual network ACL applied to router interfaces. The ACL is stateless, so you've to define both inbound and outbound for a particular traffic. It can be used to complement the Security Group. For example, allow inbound TCP 443 to the subnet that hosts the above Web instance. What's Elastic IP (EIP)? A public IP assigned to a public facing instance, although only private IP is assigned physically on its NIC. Think of it like an NAT address on the invisible Internet gateway. Of course, create an AWS account using your credit card. Don't worry, AWS won't charge anything to your card, as long as you stay within the free usage tier. You can enable bills monitoring if you're concern that you would exceed the free tier limit. As for me, the ultimate backstopper is to make friend with the extremely friendly AWS account managers. Start with the AWS Quick Start guides, especially the RD Gateway guide. 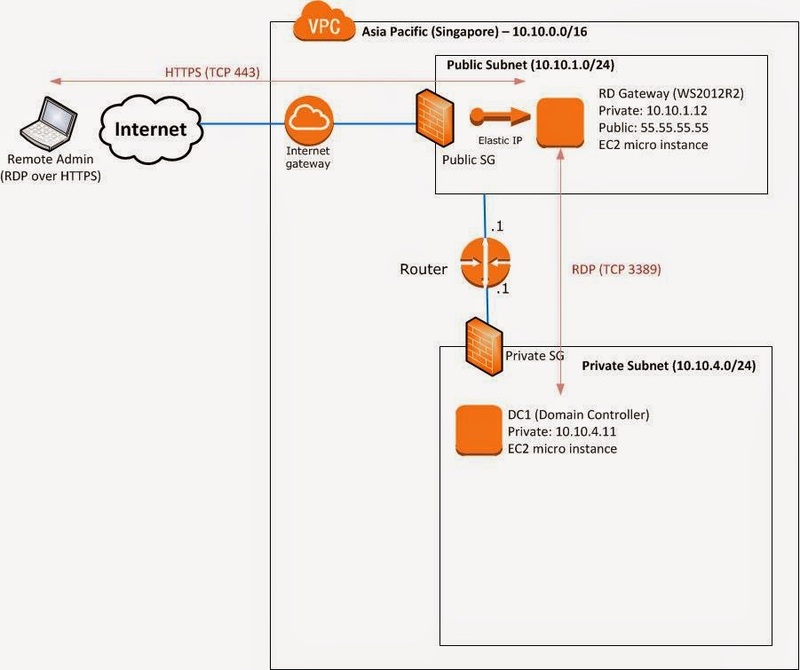 Create a VPC with 2 subnets - one public facing (i.e. RD Gateway for remote admin) and another private subnet to host the internal instances. Launch new instances with a wide range of Amazon Machine Image (AMI) templates to select, including various Windows Server and Linux OSes. Configure the Security Group to allow inbound RDP TCP 3389 for the initial setup of RD Gateway instance. After the RD Gateway is successfully setup, you can tighten network security by allowing only HTTPS traffic. But can AWS really replace all on-premise private cloud networks? It definitely hold promises due to its great elasticity and flexibility. The next challenge depends on how fast its metering jump, whereas in private cloud world where metering is rarely looked at (lest even use). Much like the debate of whether it's more economical of hiring taxi daily vs owning a car, which cost can be astronomical in Singapore. 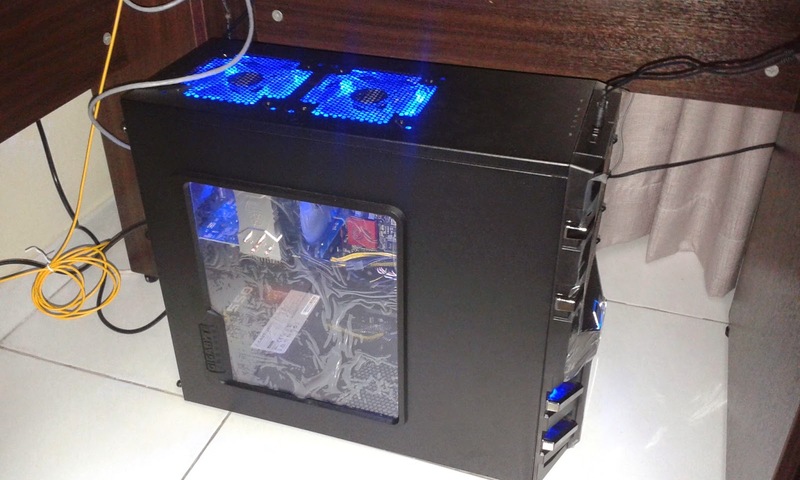 My latest DIY computer: i7 CPU, 16GB RAM, full SSD drive, Nvidia GTX 650 GPU, Gold-class PSU and a brand new LED monitor. In a blink of eye, Windows and most apps will fire up instantly without delay. All in for just SGD 1,600. Realised my dream to have a home "Data Center in a Box" by enabling Hyper-V for both entertainment and R&D purposes. I can bet that this monster can run faster than all the 5-figure and 6-figure servers at my workplace. As for Cisco routers simulation, I'll need VMWare ESXi for the CSR1000V. I'll work on ESXi USB stick for alternate boot, using my old laptop to vSphere in.